Bodhidharma (Daruma in Japanese) was an Indian prince and the founder of Zen Buddhism. He travelled from India to China in the sixth century seeking enlightenment through Buddhist practice. He is said to have gone to Luoyang in northern China where he sat facing a wall for nine years, and meditated for so long the wall started to disintegrate. 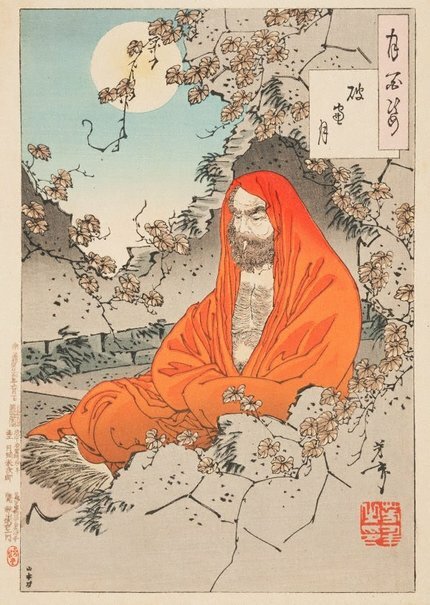 Here, Bodhidharma is sitting in meditation under the moonlight. Struggling with his thoughts, he appears fierce rather than calm. Natalie Seiz, Look , 'Lunar orbit', pgs.24-28, Sydney, Aug 2016, 26 (colour illus. ).